Vivienne Franzmann’s The Witness is more complex than your average family-conflict play: It explores themes of race, class and privilege contained within a small yet odd family. Deeply involved with the Rwanda Genocide, The Witness asks us what price is too high for the sake of the perfect story, the perfect photograph, and demands us to consider the privilege and power given to those who do not experience but simply document horrific events. Director Richard Scharine and lighting designer Seth Miller weren’t playing around with the themes of the play. As soon as the house lights were down, a documentary of the Rwanda War was projected onto the set accompanied by traditional African music and sounds gunshots. The visuals, usually in photographic form, continued throughout the first act between each scene. Just as quickly, the documentary ended and lights exploded onto the set, depicting a young Black woman, Alex (Michaela Johansen) and her white father, Joseph (Andrew Maizner), in their small but attractive London home. Alex had recently been accepted to Kings on a scholarship. Joseph used to be a photographer for the military and became famous for his pictures of the Rwanda War. Their relationship is obviously affectionate, as the two of them give each other gifts, hug one another, and tell stories of their recent past, catching up from the time that Alex had been at school. As the story moves forward, however, the affection quickly turns to suspicion as both Alex and Joseph discover secrets about one another. Alex dropped out of school because she was the only Black girl and hated the cruel, micro-aggressive treatment. Joseph was offered an opportunity to display his photography of the Rwanda War at a gallery in London—but he refuses to do so and doesn’t want to tell Alex why. As the secrets pile and pile against the two characters, the audience slowly discovers the truth about Alex’s past: Alex was a child in the Rwanda Genocide 18 years ago, and it was Joseph who had found her among her murdered family and decided to save her, bring her back to London, and to raise her as his own with his wife. The greatest element of surprise is when a man from Africa, Simon (played by Calbert Beck), contacts Joseph claiming to be Alex’s brother—and he flies to London for the first time to reunite with her. In the midst of secrets, betrayals, confusion, and family feud, Beck brings a great liveliness and humor to the play. My favorite scene was when Simon and Alex discuss hip-hop and decide to throw on some tunes. Unexpectedly, the siblings jump onto the couch and hilariously dance as though they are 5-year-olds on a sugar high—and Joseph walks into this scene as he comes downstairs. Beck stole the show with his comedy, his dance moves, and showing how affectionate and loving Simon is toward his sister. 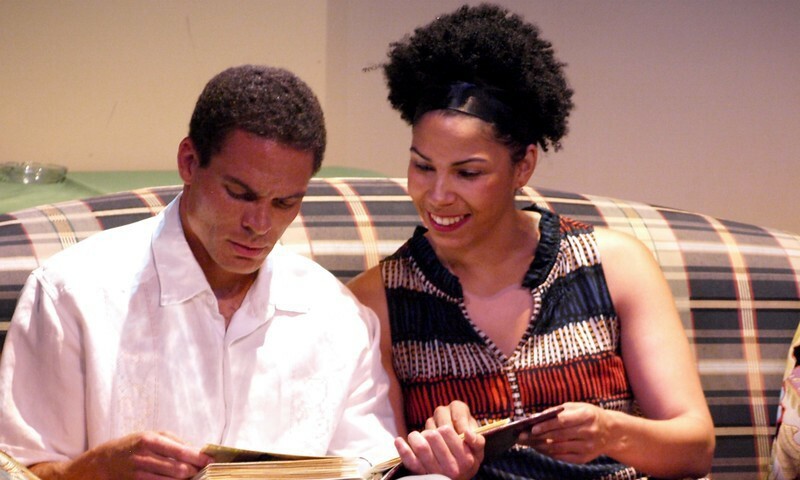 The Witness shows Aug, 11–13 at 7:30 p.m. and Aug 13 and 14 at 2 p.m. at the Sugar Space Arts Warehosue. By Vivienne Franzmann (2012); directed by Richard Scharine; set design by Haylee Rasmussen; lighting design by Seth Miller; costume design by Linda Moon. A production by People Productions. With: Michaela Johansen, Andrew Maizner, and Calbert Beck. For more information, visit peopleproductions.org.